conifer wood, planed, board thickness 20mm, kiln dried till 14-16% humidity. 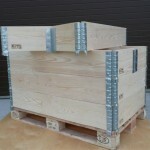 All our collars are heat treated according to the IPPC/ISPM15 regulations. We offer standard and non-standard dimensions. 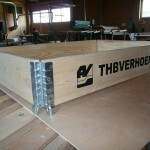 Collars can be produced from 100 to 450mm height. Collars can be produced with 4 or 6 hinges. 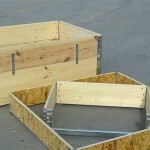 We are able to produce various sizes of the pallet collar, plywood lid, dividers and to fulfill your other individual requirements. Your company logo might be printed on the collar as well!